I just returned home from a most inspiring conference called "Growing Together: Kids, Animals and Sowing the Seeds of Resiliency" held at Green Chimneys in Brewster, New York (the history of its name can be read here, the list of speakers can be seen here, and informational videos can be seen here). I'd been to Green Chimneys twice before. However, when I arrived there to attend the meeting and to present the keynote address, I was shocked at how much it had grown and when I saw all they had done in the intervening years, including their Clearpool Campus (details about their expansion offered by its executive director, Joseph Whalen, can be seen here). Green Chimneys, founded by Sam and Myra Ross, grabs you the second you enter the grounds and see gorgeous landscapes and you meet numerous diverse nonhuman animals (animals) and humans, including the amazing staff and lucky kids who attend school there. In many ways the nonhumans and humans educate, help, and heal one another. "Helping our young people to maximize their potential by providing residential, educational, clinical and recreational services, in a safe and supportive environment that nurtures connections with their families, the community, animals and nature. From the start, Green Chimneys' philosophy has been based on the belief that if children are given a chance to explore and discover their inherent strengths in a safe and structured nature-based environment, their self-esteem, compassion, coping and social skills will improve. The concept of an enriched treatment setting that brings people together with animals and plants in a mutually beneficial relationship lies at the foundation of the Green Chimneys approach. Human-animal contact - and contact with all aspects of nature - can have a profound effect on people; these elements are an integral part of the Green Chimneys campus and organizational identity. Each of our programs celebrate the dignity and worth of all living things and our goal for our children, our staff, and all who partner with us is to bring knowledge and meaning to our relationships with the world, and with each other." You can read about their residential treatment center here. When I arrived this time I was met by Michael Kaufmann who directs The Sam and Myra Ross Institute and the Farm and Wildlife Center. Before I could even say "Hi Michael, I'm glad to be here," Michael, with contagious zeal, started walking around showing me the facilities and introducing me to humans and other animals and telling me all about Green Chimneys' remarkable growth and amazing achievements. 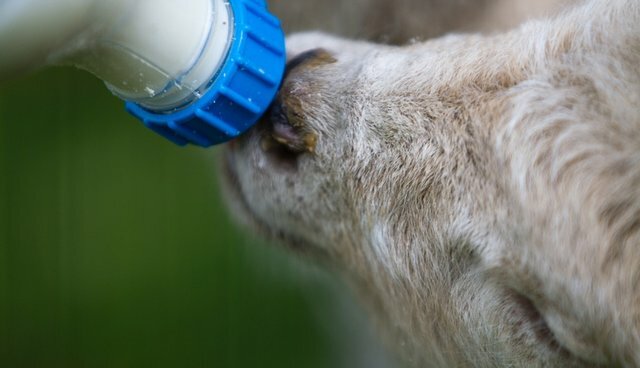 Their Farm and Wildlife Center is now home to over 300 farm animals, permanently injured or imprinted wildlife and horses. The main purpose for each animal's presence is to thrive in the care at Green Chimneys and play a supportive role in educational and animal-assisted therapy for children with special needs. By sponsoring an animal, you are directly supporting the daily care for our most popular teachers - our animals! While the people whom I met were wonderful beings, I also met other fascinating beings including some horses, goats, mules, pigs, rats, snakes, and birds who are lucky to be there. 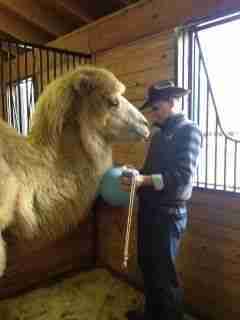 I also met two Bactrian camels, Phoenix and Sage, who arrived at Green Chimneys from Sacred Camel Gardens. Michael told me that adding camels to the diverse therapeutic, educational, and recreational programs at Green Chimneys has offered the students, staff, public, and anyone who comes here a chance to connect with yet another animal, to build healthy and meaningful relationships, to learn, and to benefit from the interactions with other people in the presence of amazing animals. He also told me that camels are used very effectively in animal-assisted therapy and humane education and that kids and adults can learn just how gentle these huge intimidating animals can be. I sure did! As we walked around I also met Wilbur, a rather large, some might say huge, pig, who lives with Vanilla, a goat who prefers the company of pigs to goats. Wilbur was sold as a young pig at an auction and a well-intended person bought him, only to keep him in a suburban home. They soon found out they could not keep a pig and gave him to the New Rochelle human society, a dog and cat shelter. The shelter called Green Chimneys and asked if they had a home for Wilbur. They happened to have a space for him and he went to live there. Wilbur and Vanilla are always together and their interspecies friendship models a lot for the people who meet them. The next day the meeting began and as I mentioned above, you can read about the diverse group of presenters here. You can read Michael Kaufmann's description of the meeting here, and contact him at mkaufmann@greenchimneys.org for more information about the program. Another very positive aspect of the conference was the presence of Philip Tedeschi, director of the Institute for Human-Animal Connection (IHAC) at the University of Denver's Graduate School of social work, and a group of around 35 students in their graduate program, along with Nina Ekholm Fry who is an expert in equine-assisted therapy and who is a Fellow of IHAC (please also see). IHAC is a center for the study of the interrelationship and health of people, animals, and the environment. I only wish there were many more places like IHAC. Some wonder why IHAC would be located in a school of social work, and my response is that numerous problems in human-animal interactions are indeed social problems at their core. I was, and continue to be overwhelmed, with the diversity of topics that were covered and more so with the dedication of every single person who attended the meeting and the amazing people who work selflessly and tirelessly -- sometimes 24/7 -- at Green Chimneys. Kids and animals in need, along with everyone else, can feel good about Green Chimneys and I strongly suggest that you visit their website and take the time to visit them personally. I guarantee you will not be let down. I want the world to know about Green Chimneys as it can serve as an excellent model of how human-animal interactions are central to our own rewilding, healing. and well-being on our fascinating and magnificent planet. Green Chimneys rocks!